I’m 1.64m short. Wearing heels is not a challenge for me anymore, as I wear them all the time. Or at least, that is what I thought before I came to Cannes – a film festival that puts a completely new perspective on the importance of wearing comfortable shoes. Since walking is the fastest mode of transport between different film screenings and our apartment, the main activity you undertake next to watching movies and writing articles is walking everywhere. Or running, for unimportant people like me who need to be at the cinema to start queuing at least 1 hour before the screening begins. After only one day my feet hurt and where full of blisters, which got me obsessed with the kind of shoes people were wearing, as I naturally wanted to be up on Cannes-trends. 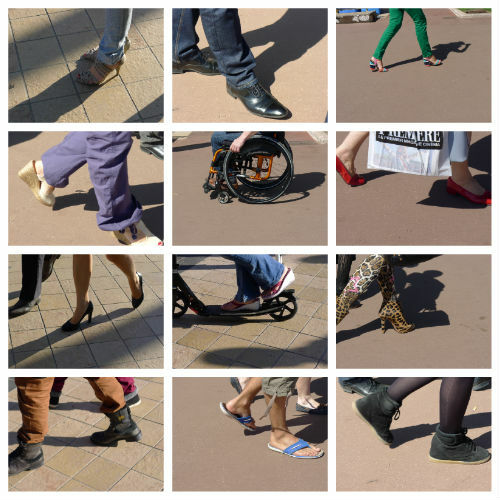 Throughout the week I took pictures of ordinary and unordinary walking equipment (see above), and can say for a certainty that the true Cannes-shoe doesn’t exist. For some people the Cannes film festival is as much about the gowns and shoes on the red carpet as the films and awards, but others really don’t mind wearing the most ugly garb, as long as they are comfortable. And I must say, after a week in Cannes I wouldn’t mind wearing socks with sandals anymore. Even though it has been a fashion faux pas for as long as I can remember, convenience just trumps vanity. Looking at my blisters I decide I don’t need my heels anymore: Cannes is an uplifting experience anyway!